Charlie Wiener has been a touring comic for the past twenty five years, headling for the past eighteen. He has performed in forty seven states and three Canadian Provinces as well as appearing on A&E, Comedy Central, Club 54 on the CBC and hosting his own cable shows Wienervision and Off the Wall. He has shared the stage with such luminaries as Bobcat Goldthwaite, Ellen Degeneres, Bobby Collins, George Lopez and Randy Newman. 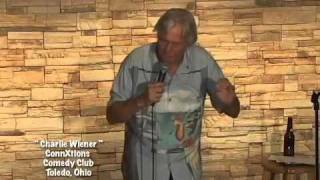 He has appeared in numerous commercials on radio and TV and in the view more..
Charlie Wiener has been a touring comic for the past twenty five years, headling for the past eighteen. He has performed in forty seven states and three Canadian Provinces as well as appearing on A&E, Comedy Central, Club 54 on the CBC and hosting his own cable shows Wienervision and Off the Wall. He has shared the stage with such luminaries as Bobcat Goldthwaite, Ellen Degeneres, Bobby Collins, George Lopez and Randy Newman. He has appeared in numerous commercials on radio and TV and in the movie 'Sweet Dreams'. For any further comment or recommendation contact his wife or children and they will attest to his being absent from their lives for long periods over the past quarter century.